March 20, 2018 | March 20, 2018 | Apart from her knowledge and training, Adriane Delaney, women’s health nurse practitioner, has something special to offer the patients at the UAMS South Regional Campus in Magnolia — herself. Health care providers often are in short supply in rural parts of the United States and south Arkansas, and patient demand for the services she offers continues to grow and show that Delaney is meeting a real health need. The American Academy of Family Physicians says 20 percent of the U.S. population resides in rural areas, but only 10 percent of all physicians reside there. In 2016, Delaney started work at the Family Medical Center at the University of Arkansas for Medical Sciences (UAMS) South Regional Campus. Although she’s not a physician, she helps meet some of the need for women’s health care. The patient demand for Delaney’s services has steadily risen, and her patient volume grows each month, Gooch said. 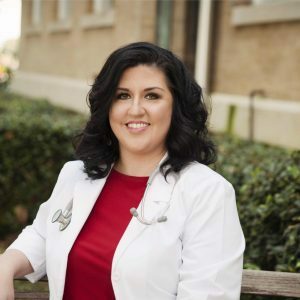 Delaney said to her knowledge, she is one of only two women’s health nurse practitioners in south Arkansas. A second women’s health nurse practitioner, and a colleague Delaney knows well, practices in El Dorado. Much of the patient demand Delaney sees is for birth control and general reproductive health, she said. She also spends a good part of her working life on health literacy, especially with young women. Delaney is trained to implant birth control, including intrauterine devices, and do colposcopies to look for the presence of cervical cancer. And, although her studies for her master’s degree are now in her past, she continues to educate herself. Working in a learning environment like UAMS South positions Delaney professionally to receive the latest information to better educate the public, too. She has strong family roots and personal history in Magnolia and the region, and she said that puts some folks at ease in talking to her about personal health issues and questions they have.